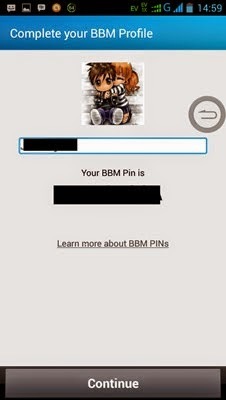 If the display picture does not appear Androidmu BBM picture when viewed from BBM friends, then it is likely pinmu suspended because previously tried to download a version of which has not been officially released, so the trick you have to create a new id on the official website of Blackberry id. If you have already registered then un-install it first fuel you've previously installed and then entered to the time when you used to do. If you've managed to get in the application of fuel, and also managed the first time you will then be asked to enter the country and date of birth, you just follow what was ordered. If completed, you can then menginvite again all your friends before, then display your picture will appear. This trick should work and function optimally, you might ask your friend about whether the trick is really successful or not, to ask for help to friends to see if the display in the display fuel picturemu friend has changed or not, if it means you've successfully changed. If your BBM display picture still does not appear, it means that the existing bugs from the original, so you can not do anything except wait for the update to the latest version of BBM app Android. Share your BBM for Android smartphone users Andromax, and encountered similar problems, you can try this trick. Sign the settings menu on your Android smartphone, then find and open the options menu developer, after that look for menu-force GPU rendering, remove centangnya. However, some users said that this problem can also occur on smartphones in addition to Andromax, do the same for the settlement of problems in both the smartphone Sony, Samsung, Lenovo, HTC's Android even local developers as well. To help see how you can see in the image into 3 I show above, may be useful.